Our delicious barbeque chicken burrito bowls are perfect for busy weeknight dinners and also great for meal prepping. Made with black beans, corn, avocado, and cheese, this recipe is quick and easy to prepare. The timesaving secret? Buy a cooked rotisserie chicken at the grocery store and shred it when you get home. (Also a great use for leftovers!) In just about 15 minutes you will have gluten-free meals ready for the rest of the week! Overwhelmed with leftover holiday turkey? This recipe is a great way to jazz up leftovers after a big family meal. Per Serving: 761 calories; 24g fat; 92.4g carbohydrates; 47g protein; 118mg cholesterol; 1056mg sodium. 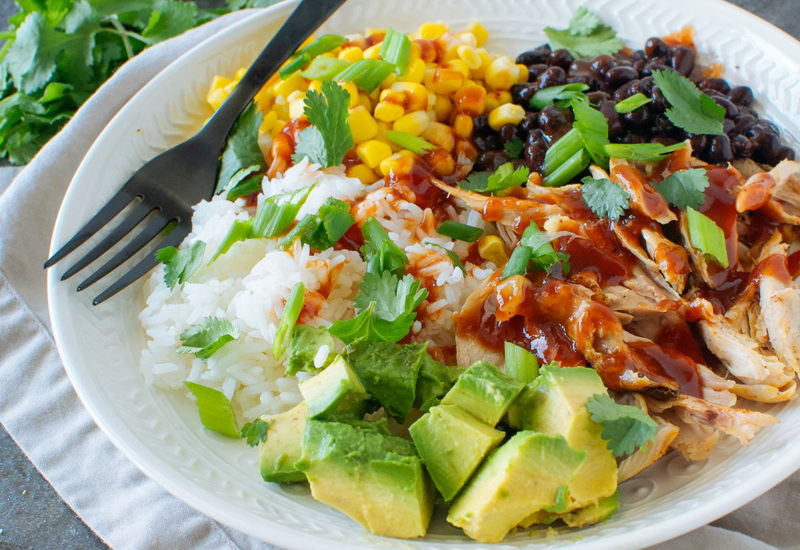 These bbq burrito bowls are everything! So delicious, healthy-dish, and perfect to throw together on a busy weeknight with enough left over to eat for lunch the next day. So yummy. I also love the rotisserie chicken because I usually don't have time to make chicken. Really good meal prep recipe that's healthy and nutritious. I skip the rice and use greens or quinoa instead. The sauce was also delicious. This bbq chicken bowl was so delicious! My husband was hesitant to try the Mexican-themed ingredients paired with barbecue sauce, but we both were super impressed with the way it turned out. It was so easy to throw together, and is perfect for meal prepping. Lots of really good flavor! Never through bbq sauce would go good with corn and beans but I love this recipe! It's perfectly for weekly meal prep. I just pop it in the microwave and I'm good to go. Super easy and yummy! Definitely will make again! My sister and I love these bowls. We used rotisserie chicken with canned black beans and canned corn. Don't slice the avocado until you're ready to eat this. Just pack it with your meal prep items. Also, store bought BBQ sauce works great. This recipe was awesome and everyone in my family loved it! The ingredients were so simple but I never thought of putting them all together. I had left over grilled bbq chicken and corn on the cob - so had some ingredients already. I used garlic and onion seasoned black beans and the added flavor was tops! My bbq of choice is Sweet baby rays! This super easy and fresh dish will be a regular for sure! !